If you visit Morocco, do come in April. 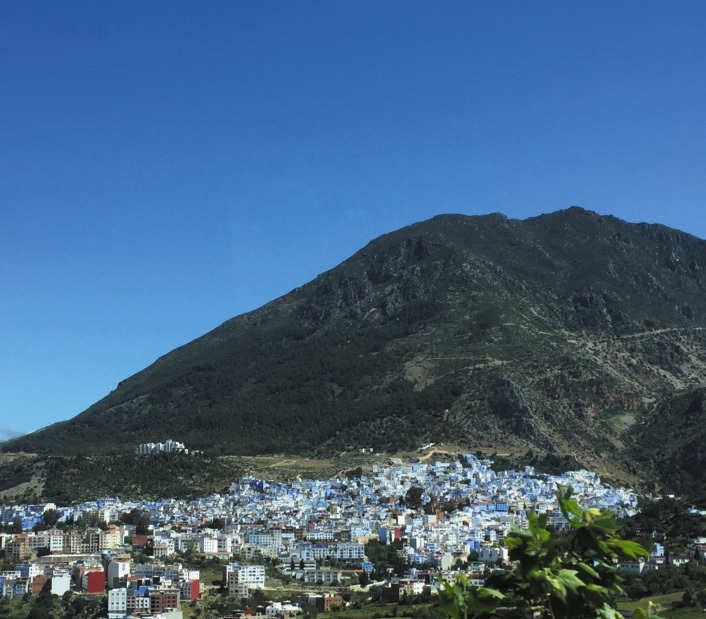 The road from Volubilis to Chefchaouen goes straight north through pleasant, surprisingly green landscape with rivers, blooming fields, orchards and pine forests under the sunny blue sky. 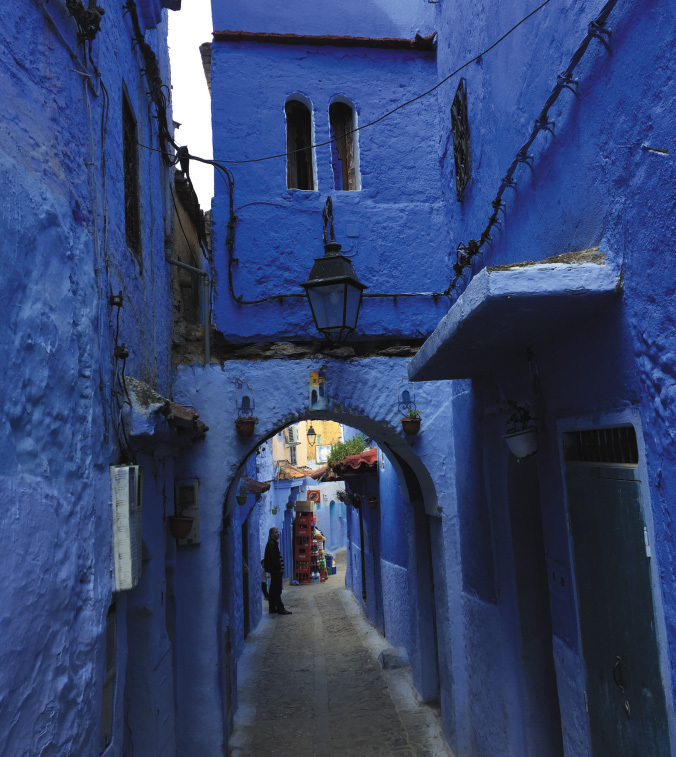 But even the colorful tapestry of red poppies and yellow marigolds does not prepare you for Chefchaouen, a blue city squeezed between two mountains. Morocco is a country of vibrant colors. 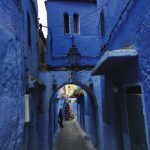 After pinkish Marrakesh, the green oasis below the slopes of the dry High Atlas, and orange dunes of Sahara, you are still surprised when you arrive in Chefchaouen. 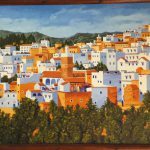 If we saw many Riads on the way here empty or half empty the hoteliers in Chefchaouen do not have a problem with vacancies. 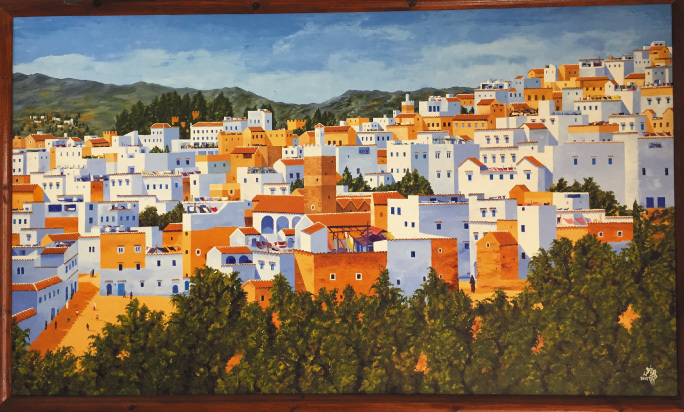 Local or foreign tourists come here in droves for The city looking like this image hanging on the wall in Riad’s lobby. The city is built on the steep slopes with a „waterfall“ (mind you the Moroccan understanding of this word is NOT what you visualize as Niagara or Victoria Falls!) with narrow alleys barely fitting a donkey saddled with two boxes of Coke, tourist negotiating stairs and wondering if they ever find the way through this maze back to their cozy riad. When you arrive here you are overwhelmed by blue-ishness of this place. I wonder if young Picasso was here and this experience actually triggered the beginning of his Blue Period. And is the blue paint here a Moroccan answer to whiteness to Pueblos Blancos of Andalusia, just a short distance from here? Anyway, the influence of African Art on Western artists is well documented. If Picasso was ever here I can imagine he must have been blue on his return and he did not recover until he went with his friend Braque to the exhibition of African masks in Paris and started cubism. Klee came to Tunisia and his work was never the same. I can easily see how that happens as I am absolutely stricken by the abstract Berber rug motives drawn from the Saharan landscape. 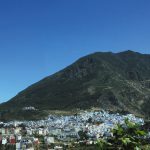 But I do not want you to think my impressions of Chefchaouen were so much „Rapsody in Blue“-like as my last act before coming to this blue city was a pleasant lunch of shishkebab I ate with a great tomato salad in a small sidewalk eatery in Meknes. Think of the brutal attacks by Arab Moslem invaders to imagine what happened in my internal piping as bacteria progressed speedily down through my body and established an independent caliphate. Instead of discovering the next blue alley of this town it was rather a search mission for the nearest public rest room. When you do find it, act fast identifying what features describe it best. Is it of European or rather Turkish origin? When you figure that out you can the negotiate the proper hygienic tools needed to complete your mission fast, as time is of essence, because bacterial raiders do not take a break on their way down. Well, this was supposed to be our first day off. A leisurely day filled with strolls interrupted by Moroccan culinary delicacies both sweet and spiced. Instead it was short jaunts interspersed with rest in our cozy blue nest and nutritious intake limited to black tea, water and a variety of western chemical remedies. 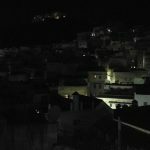 Instead of getting some restorative sleep, after a feverishly hectic night l finally fell a sleep at four in the morning just to be violently woken up by a muezzin’s call for the first morning prayer. What I missed on our arrival was a location of the nearest mosque with its top barely twenty feet from our top floor room. The power of his: „Aaalla-a-a-h Akbar!“ almost knocked me off my bed and my first thoughts were that I spent the night with the Almighty in my bed rather than with my wife. During the day I was part time resting in bed or limping around our riad taking pictures here or there. 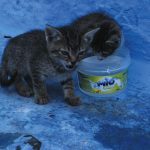 I envied the local cats, who were generously fed by the locals, as I dropped any idea of eating from my regular schedule. 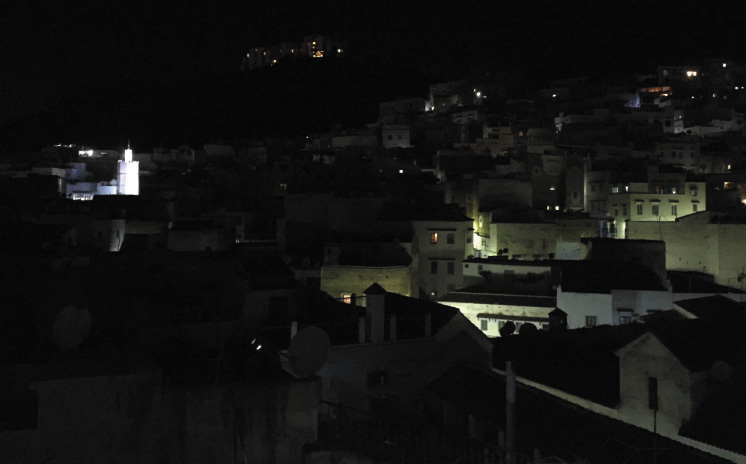 Only by the evening I was able to join my lovely companion for her dinner on the terrace of Bab Sour Restaurant to see what delicacies are available to her and the local family with twin girls as their French conversation was nicely flowing across the table. Meanwhile my attention stayed pretty much where it was whole day, sipping occasionally from my bottle of mineral water. But the view from the terrace was spectacular!